Clean registry and Speed up your PC without upgrade! Fix registry fast or continue suffering from registry errors and bugs? Registry is an important part of Windows operating system. Clean registry fixed in time is a pledge of friendship between a user and a computer. Registry contains all the information about your personal computer settings, software and hardware. Keeping your registry clean you can be sure you computer won't betray you. Installing and deleting different software, changing operating system settings, plugging new hardware and simply working with your computer you contaminate the system registry over time. Manual registry fix is impossible in most cases. Wrong file paths, corrupted entries and other kinds of erroneous and obsolete data definitely slows down every program you run. Regular registry fix is a best way to keep your registry tidy and protect your PC from internal errors. You should clean registry regularly to keep your computer and your Windows fast and stable. Registry Cleaner is a handy, easy, fast and up-to-date way to control your computer's stability and performance by registry fix and scan. 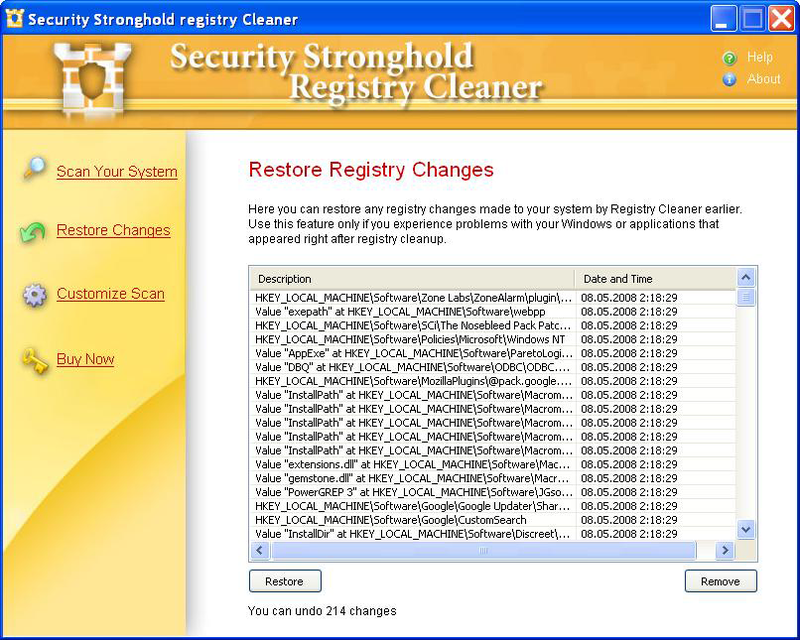 Registry Cleaner searches for and fixes various registry problems like wrong paths, invalid shortcuts, corrupted COM entries, ActiveX interfaces, CLSID values, explorer extensions, BHOs (Browser Helper Objects) and other kinds of erroneous and obsolete data. All scums and registry errors should be fixed in time. With Registry Cleaner you'll free your computer of a burden of the entries that were created long time ago and now just slow your computer down without providing any necessary functionality. Don't procrastinate registry fix - take care of your computer operability. You can customize each and every aspect of registry cleaning process while Registry Cleaner tweaks your system on 21 different levels (parts of the registry). Only you decide what should be cleaned in your registry. If you don't want to dig into technical details, Registry Cleaner will choose the best registry fixing and tweaking options for you. Just click on several buttons and find yourself with efficient and clean registry in front of the computer which is as fast and stable as it was born again. Registry Cleaner will find out the best way to make your system more fast and stable and free your computing of nasty error messages. All the changes made into the system by Registry Cleaner software are backed-up and can be easily reverted back later. You can choose to restore all changes that Registry Cleaner performed during one of its previous scans or select some particular changes and revert them if you'd like to. Most of the error messages you see on Windows startup and when running some problems come from erroneous entries in your registry. For example, the most often case is when you uninstalled some program, but its autorun or ActiveX entries are still in the system registry of your computer. This will make Windows think that the program is still here in your computer which will cause the error message about it. Fix registry and get rid of most of Windows problems and delays. Just run Registry Cleaner, it will quickly find and fix the source of the problem in your system registry. It is so easy to solve registry errors with Registry Cleaner! Make your system more stable, fast and protected with Registry Cleaner now! Learn how else Registry Cleaner will clean and speed up your computer! Why should I purchase Registry Cleaner and not other products? Q: How can Registry Cleaner increase performance of your computer without hardware upgrade? A: The performance of your computer is constantly decreasing over time. Your computer is not fast now as it used to be in its youth. Registry clutter, obsolete data, erroneous entries in your system registry make it think much more when you run some program, open a document or play video game. Registry Cleaner frees your system registry of all the rubbish and errors that accumulated for the whole history of your computer. After total cleanup of the registry your computer operates from 20% to 40% faster than it was before � and as faster as it worked at the very moment you turned it on in the first time. Q: Is it safe to run registry clean? What if Registry Cleaner deletes some needed or important information? A: It is completely safe to clean up registry. Moreover, this is absolutely necessary to do like you brush your teeth. Registry cleaner locates and deletes only obsolete or erroneous registry entries which have no meaning for the operating system. Your Windows doesn�t need them at all. Registry cleaning is safe because during this process Registry cleaner deletes only those registry keys which have no external references or which have no information inside. If the key is not references by any other place in your system, it is not needed. If you are still concerned about the registry entries being cleaned out, Registry Cleaner has backup & restore functions. You can restore each registry entry that was deleted during cleanup � all at once or only the particular ones you select. 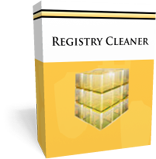 Registry Cleaner accurately stores all information about which registry entries were deleted during the cleanup, so you can easily view this information later and restore the necessary items. Q: Can registry cleanup help me to fight with spyware and adware? A: Sure! Spyware and adware often adds meaningless and erroneous keys into your system registry, mainly to make it harder to locate them. Registry Cleaner will locate and delete such entries. The other situation when registry cleaning will help is when your anti virus or anti spyware program deleted the body of some spyware or virus, but didn�t find its registry keys, and those remnants are now causing error message at Windows startup. 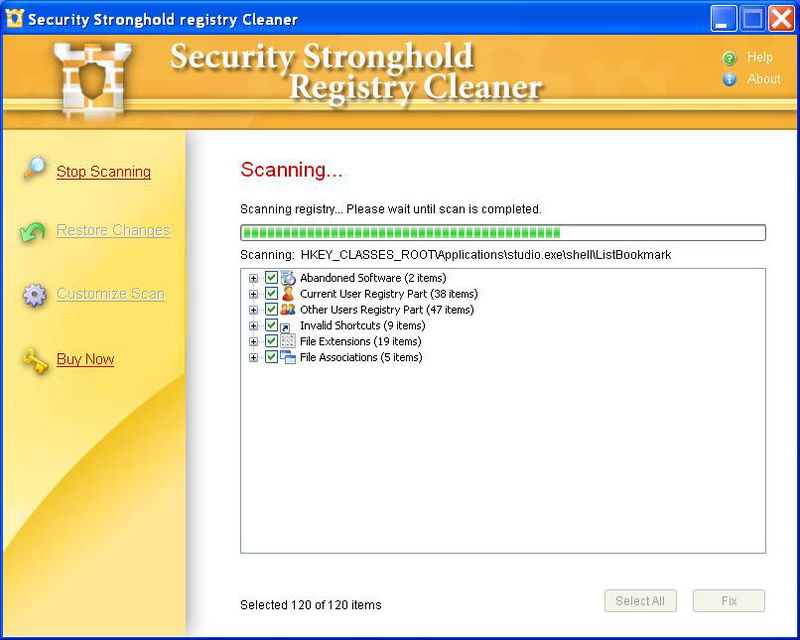 Registry Cleaner will find such entries and fix them so, that there will be no startup errors in your system anymore.